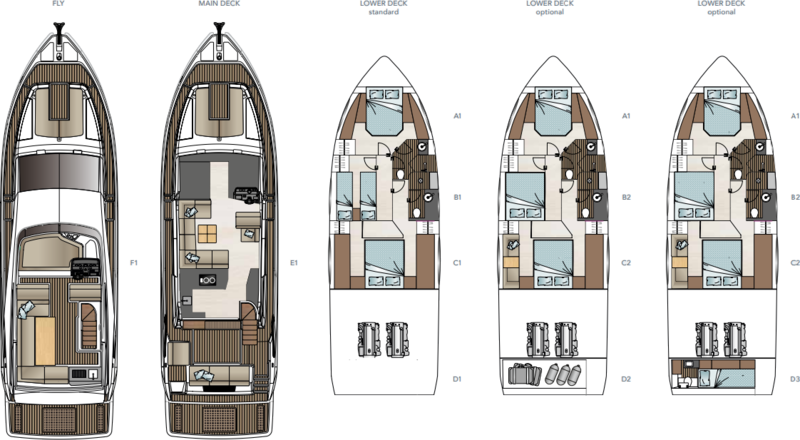 Following the successful models Sealine S330 and Sealine C330, which have sold in impressive numbers, the new Sealine design is now being continued in the over 50 ft size class. 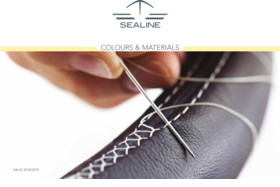 The result is the Sealine F530. The new Sealine F530 is expanding the product range and not only marks the next stage in the restructuring of the Sealine models, but also stands for the implementation of new ideas in general. The Sealine F530 is also setting innovative trends in the key areas of design, function, technology, performance, luxury and safety. Drawn by world-renowned designer Bill Dixon, this flybridge yacht impresses with a level of comfort that is usually only found on yachts over 60 ft.
A yacht for the whole family: Both the exterior and interior have the typical Sealine character. Modern, powerful hull with character. Enormous windows let ample light in the saloon and cabins and give the yacht the typical Sealine look. Vertical wings on the coaming edge broaden the flybridge towards the aft and increase the size of the covered cockpit area. Flybridge: the largest in its class, making optimal use of the space with maximum comfort. Optional hardtop on the fly or classic bimini. Operator and passenger seat on the flybridge can be converted into a chaise longue. Impressive saloon windows with a length of 3.90 meters and a height of 1.70 meters. Optional doors in the side windows provide an exit onto the side deck. A large U-shaped sofa in the saloon can be converted into two opposite sofas, opening up access to the side doors and providing a breathtaking panoramic view from standing position. The large saloon door and folding window open up a large space between the cockpit and the saloon. The large L-shaped sofa in the cockpit offers a good view of the 40 inch TV in the saloon. On the foredeck, the cozy sitting corner with lowering table can be transformed into a generously sized sun lounger. A large bimini with carbon frame provides shade on the foreship sun deck. Pop-up lamps transform the foredeck into a cosy cocktail bar in the evenings. B1 Guest cabin with twin berths, wardrobe and stowage on port side and bed table. Fully equipped day and guest head, separate shower stall with handheld shower and bracket. Comfort seat with wood cover. B2 Guest cabin with double berth and 2 drawers underneath, wardrobe and stowage on port side. Fully equipped day and guest head with separate shower stall. C2 Master cabin with double berth and 2 bedside tables, wardrobes, vanity area (composed of a table with mirror, between two seats) on port side and sideboard with stowage on starboard side. Fully equipped master head with separate shower stall. D3 Engine room with crew cabin, single berth, stowage, sink, toilet, door and window.